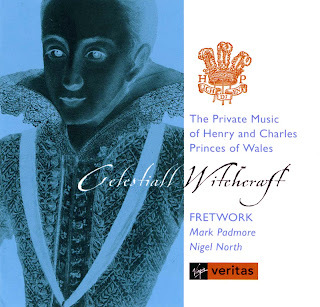 "The title of this recording comes, appropriately, from Thomas Campion’s Elegie upon the untimely death of Prince Henry: ‘his carriage was full of celestiall witchcraft, winning all to admiration and love personall.’ Henry’s musical taste was equally so and listeners to this CD are implicitly asked to consider whether, had he lived to become king instead of Charles, the course of English musical history (not to say non-musical history) might have been quite different. Coprario’s two airs – one mourning the death of Henry, the other comforting Charles – must have provided the initial inspiration for the CD. Happily, Henry’s music tutor, Alfonso Ferrabosco II, figures prominently here: two airs from his 1609 collection, sublimely sung and accompanied on the lute; a wistful pavan in three parts, delicately played with cadences that end with a whisper; and an In Nomine ‘through all parts’ of great subtlety. Thomas Lupo’s polished six-part fantasia that opens the recording – offering a further example of the sort of music Henry is known to have enjoyed – Fretwork’s performance doesn’t disappoint: it captures the rhetoric of the beginning, bringing crystal clarity to the syncopations of the middle section while articulating the musical architecture. 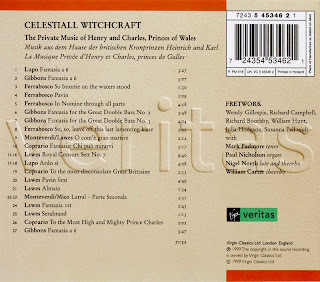 William Lawes is the composer most closely associated with the young Charles I and his music is represented on this disc by a fantasia, three dances (a mournful Pavin followed by a wittily played Almain and a danceable Saraband), an affecting transcription he made of a Monteverdi madrigal, and one of the Royal Consorts in the richer, six-part version calling for two theorbos. The two Gibbons Fantasias for the great double bass allow William Hunt to shine on his wonderfully resonant larger viol.